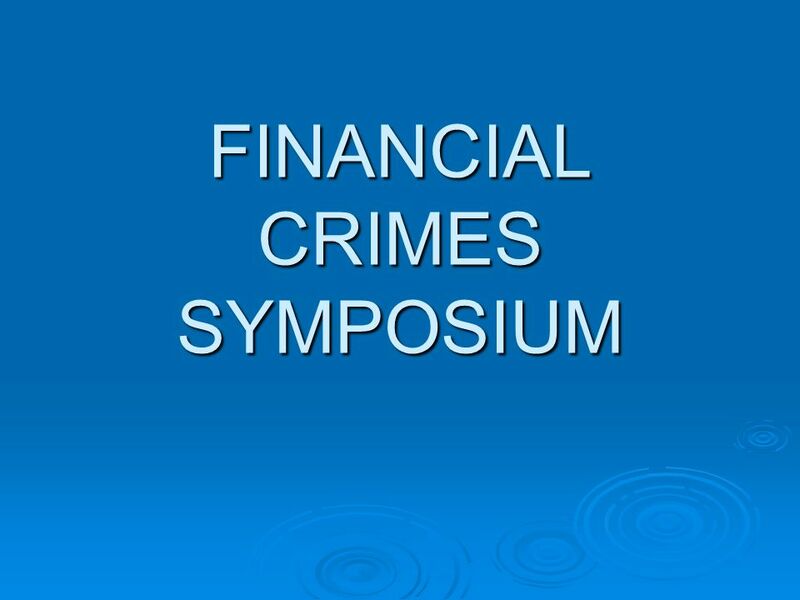 FINANCIAL CRIMES SYMPOSIUM. 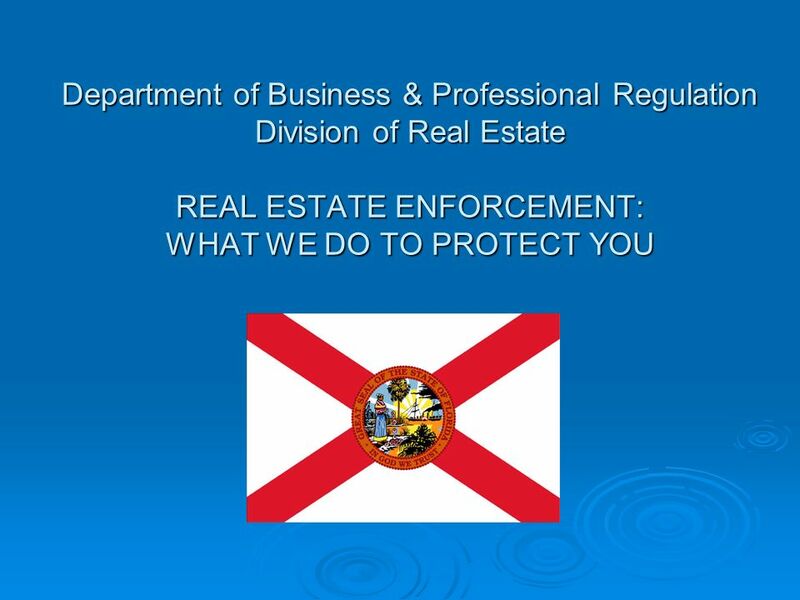 Department of Business & Professional Regulation Division of Real Estate REAL ESTATE ENFORCEMENT: WHAT WE DO TO PROTECT YOU. 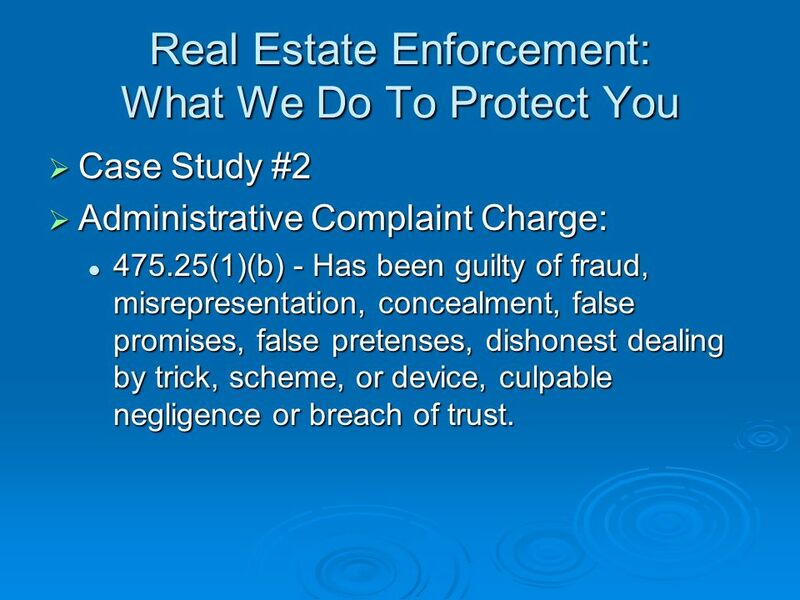 18 Real Estate Enforcement: What We Do To Protect You Case Study #1 Administrative Complaint Charge: Administrative Complaint Charge: Brokerage business records.Each broker shall keep and make available to the department such books, accounts, and records as will enable the department to determine whether such broker is in compliance with the provisions of this chapter. 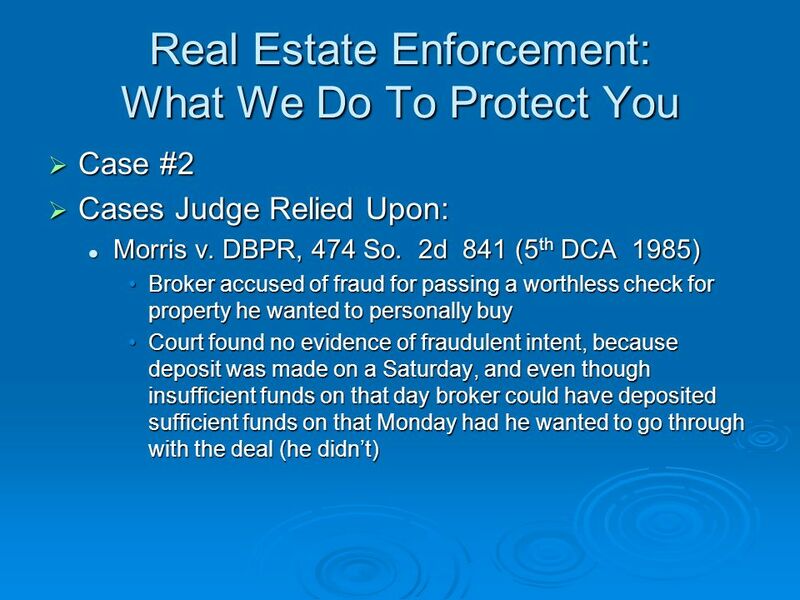 Each broker shall preserve at least one legible copy of all books, accounts, and records pertaining to her or his real estate brokerage business for at least 5 years from the date of receipt of any money, fund, deposit, check, or draft entrusted to the broker or, in the event no funds are entrusted to the broker, for at least 5 years from the date of execution by any party of any listing agreement, offer to purchase, rental property management agreement, rental or lease agreement, or any other written or verbal agreement which engages the services of the broker. 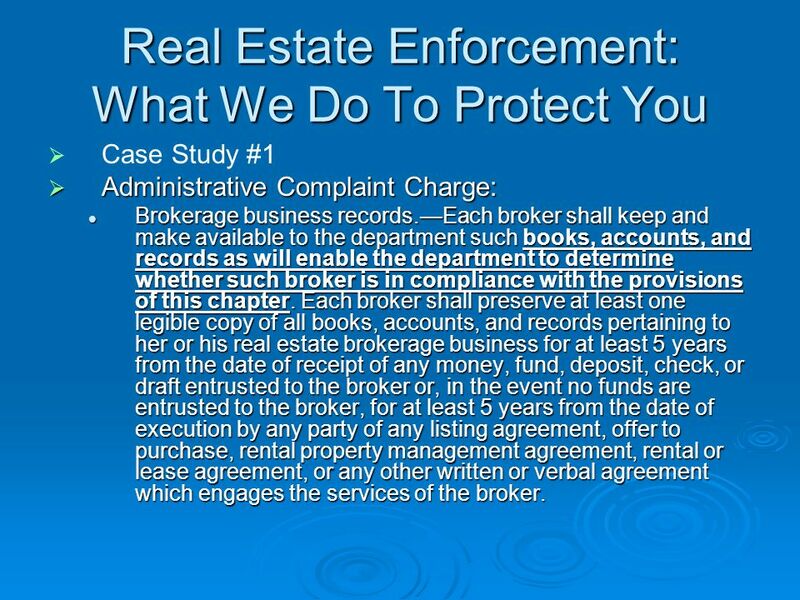 Brokerage business records.Each broker shall keep and make available to the department such books, accounts, and records as will enable the department to determine whether such broker is in compliance with the provisions of this chapter. 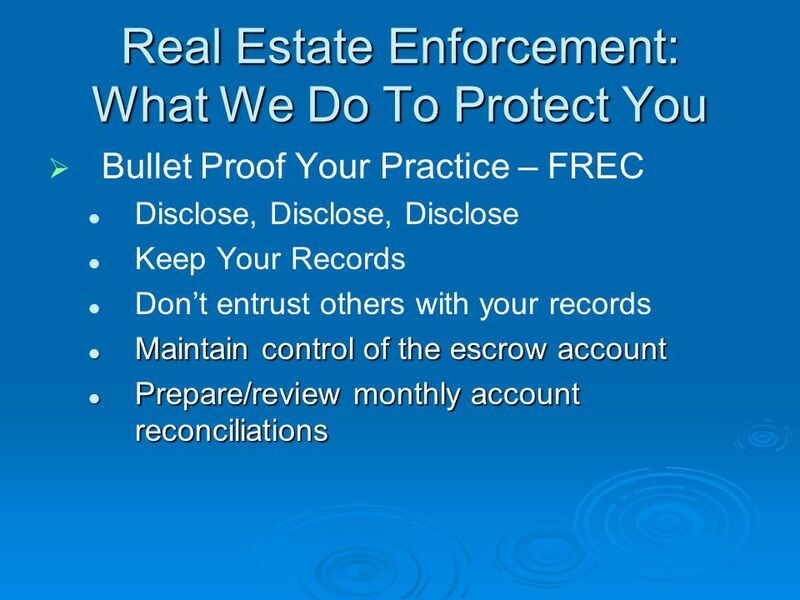 Each broker shall preserve at least one legible copy of all books, accounts, and records pertaining to her or his real estate brokerage business for at least 5 years from the date of receipt of any money, fund, deposit, check, or draft entrusted to the broker or, in the event no funds are entrusted to the broker, for at least 5 years from the date of execution by any party of any listing agreement, offer to purchase, rental property management agreement, rental or lease agreement, or any other written or verbal agreement which engages the services of the broker. 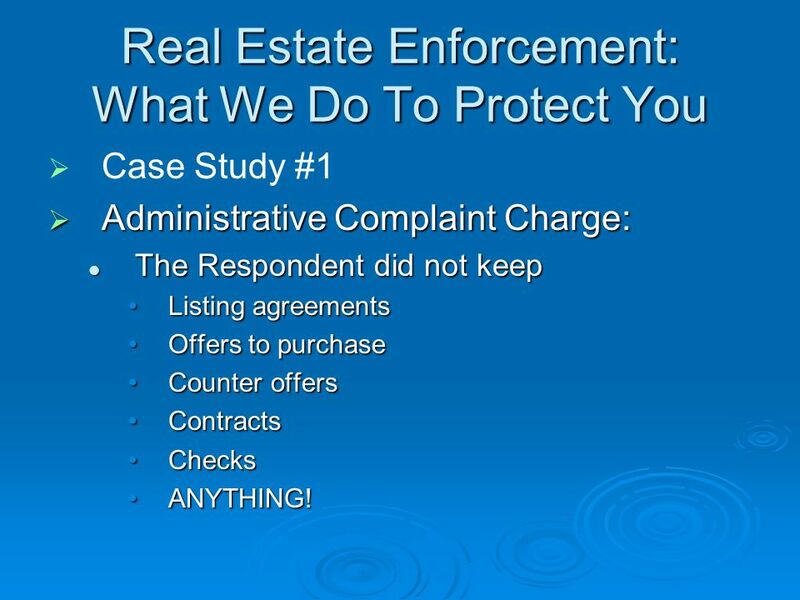 19 Real Estate Enforcement: What We Do To Protect You Case Study #1 Administrative Complaint Charge: Administrative Complaint Charge: The Respondent did not keep The Respondent did not keep Listing agreementsListing agreements Offers to purchaseOffers to purchase Counter offersCounter offers ContractsContracts ChecksChecks ANYTHING!ANYTHING! 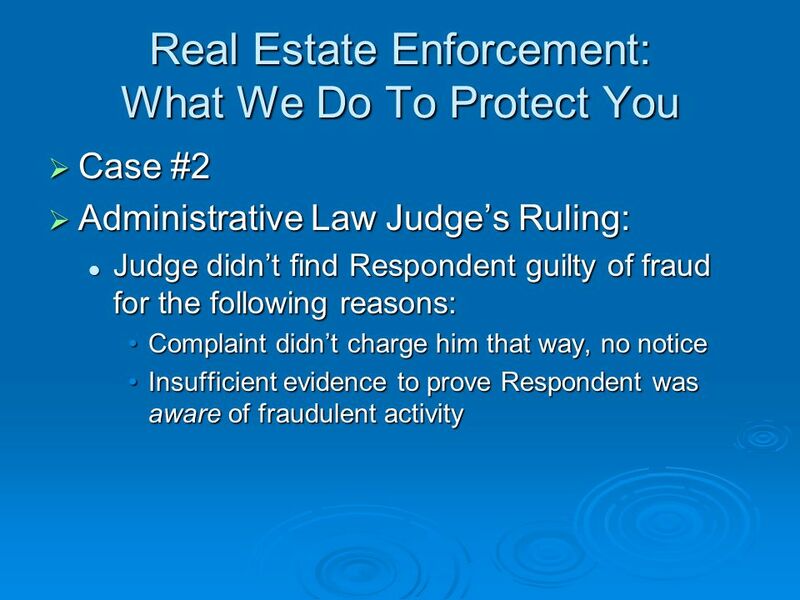 22 Real Estate Enforcement: What We Do To Protect You Case Study #2 Case Study #2 Administrative Complaint Charge: Administrative Complaint Charge: 475.25(1)(b) - Has been guilty of fraud, misrepresentation, concealment, false promises, false pretenses, dishonest dealing by trick, scheme, or device, culpable negligence or breach of trust. 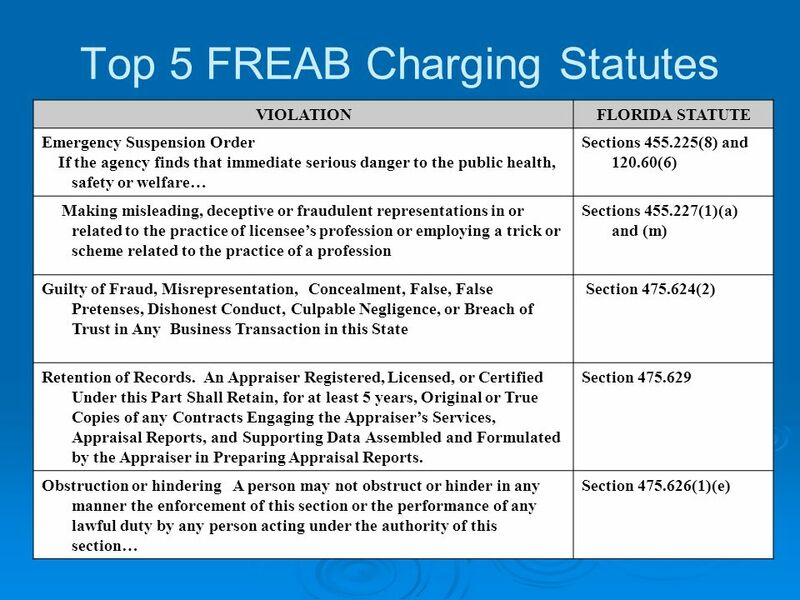 475.25(1)(b) - Has been guilty of fraud, misrepresentation, concealment, false promises, false pretenses, dishonest dealing by trick, scheme, or device, culpable negligence or breach of trust. 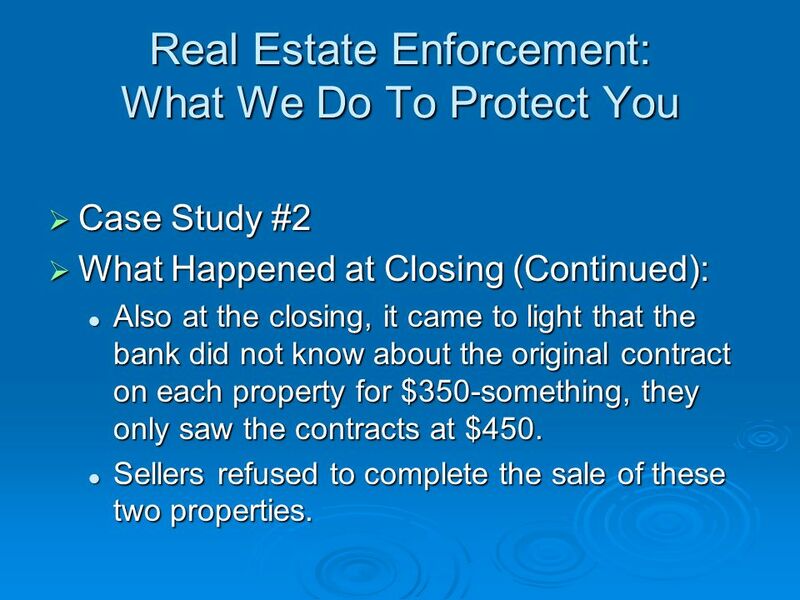 25 Real Estate Enforcement: What We Do To Protect You Case Study #2 Case Study #2 What Happened at Closing (Continued): What Happened at Closing (Continued): Also at the closing, it came to light that the bank did not know about the original contract on each property for $350-something, they only saw the contracts at $450. 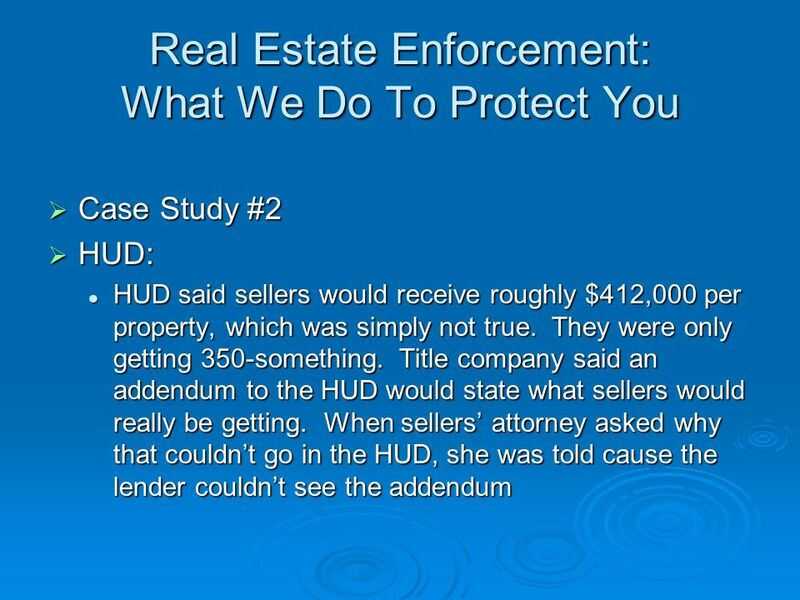 Also at the closing, it came to light that the bank did not know about the original contract on each property for $350-something, they only saw the contracts at $450. 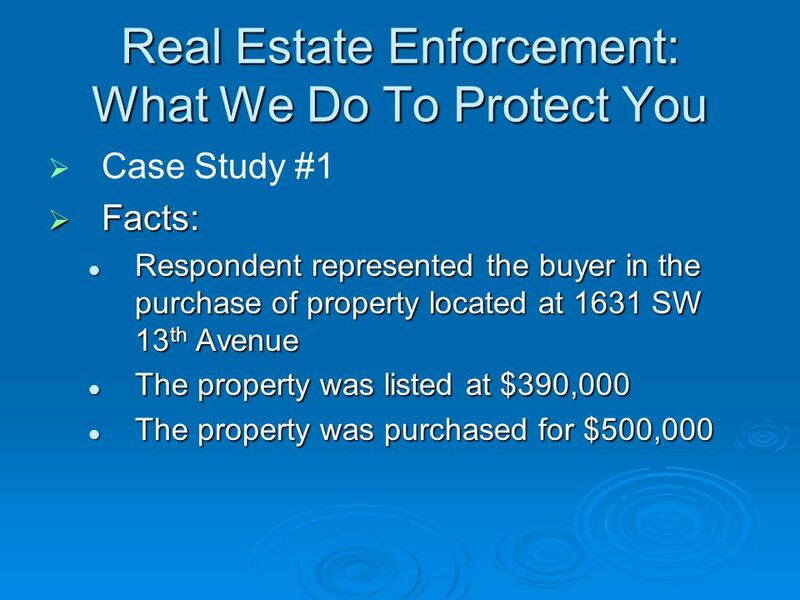 Sellers refused to complete the sale of these two properties. 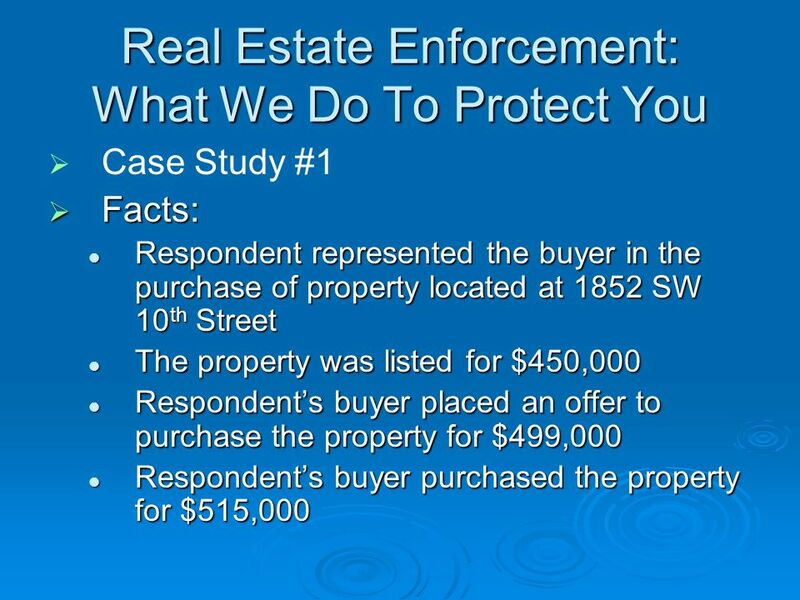 Sellers refused to complete the sale of these two properties. 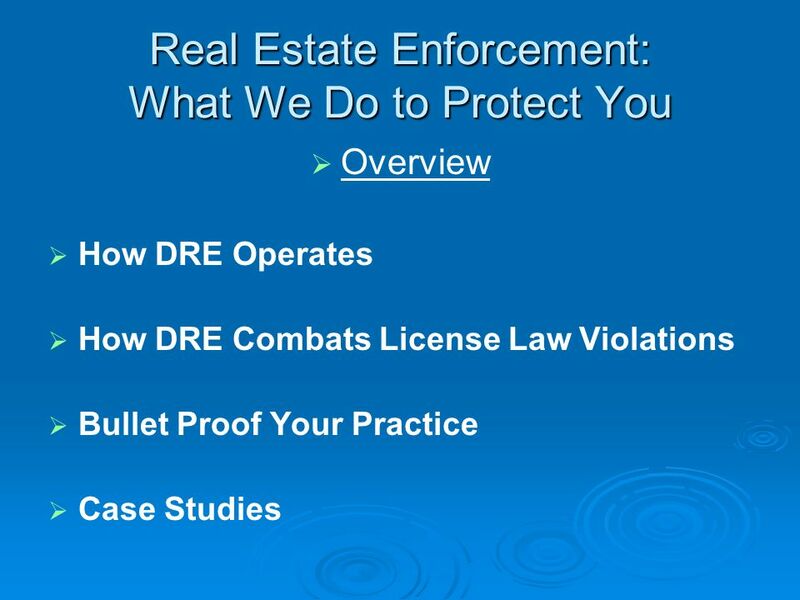 32 Real Estate Enforcement: What We Do To Protect You Case #2 Case #2 Cases Judge Relied Upon: Cases Judge Relied Upon: Munch v. DBPR, 592 So. 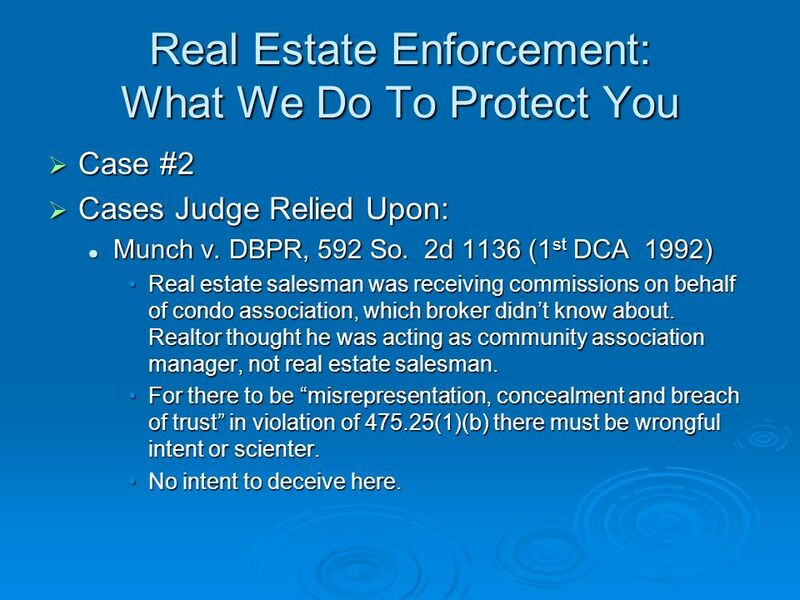 2d 1136 (1 st DCA 1992) Munch v. DBPR, 592 So. 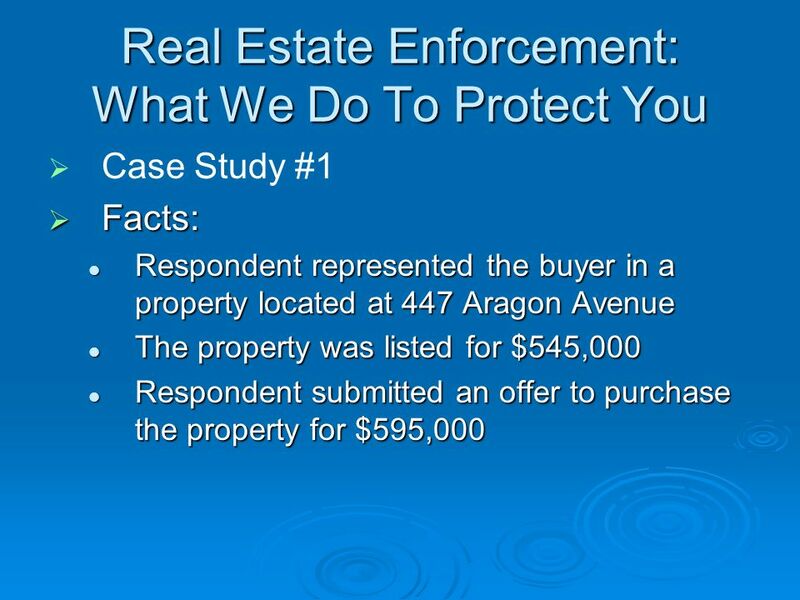 2d 1136 (1 st DCA 1992) Real estate salesman was receiving commissions on behalf of condo association, which broker didnt know about. 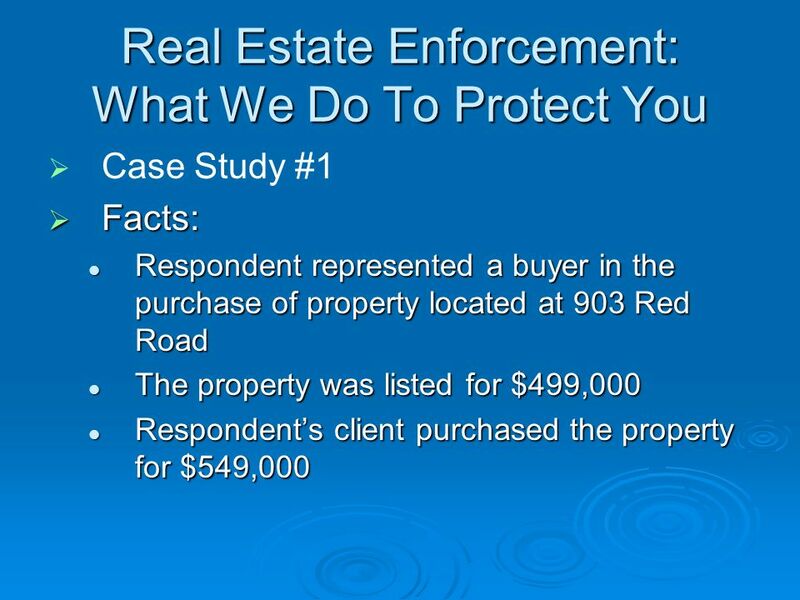 Realtor thought he was acting as community association manager, not real estate salesman.Real estate salesman was receiving commissions on behalf of condo association, which broker didnt know about. 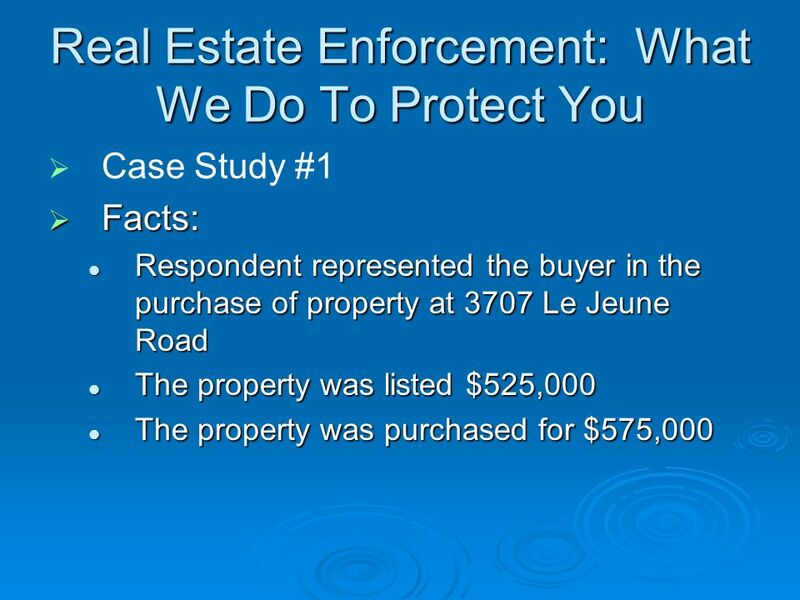 Realtor thought he was acting as community association manager, not real estate salesman. 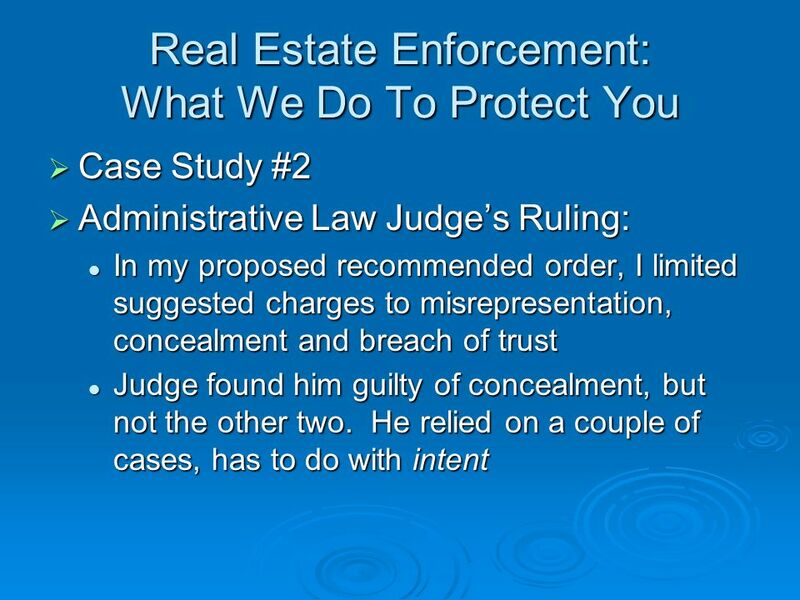 For there to be misrepresentation, concealment and breach of trust in violation of 475.25(1)(b) there must be wrongful intent or scienter.For there to be misrepresentation, concealment and breach of trust in violation of 475.25(1)(b) there must be wrongful intent or scienter. No intent to deceive here.No intent to deceive here. 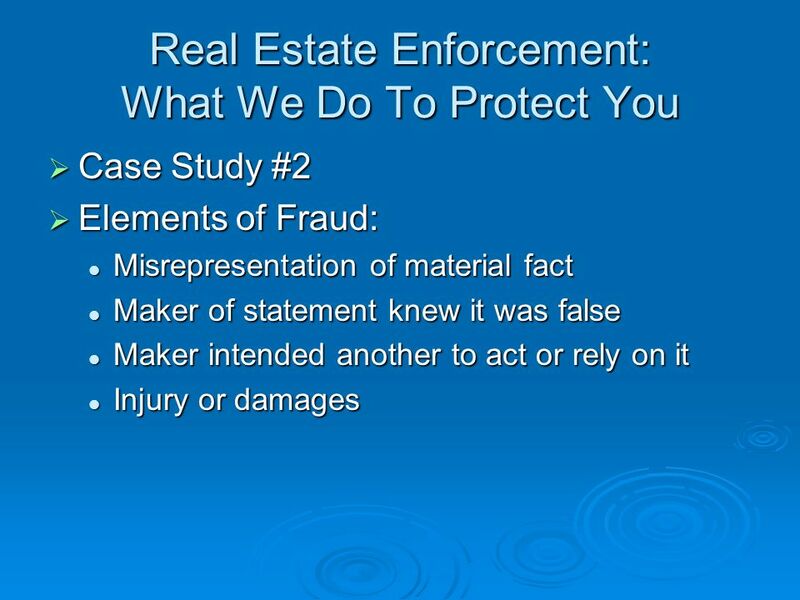 Download ppt "FINANCIAL CRIMES SYMPOSIUM. 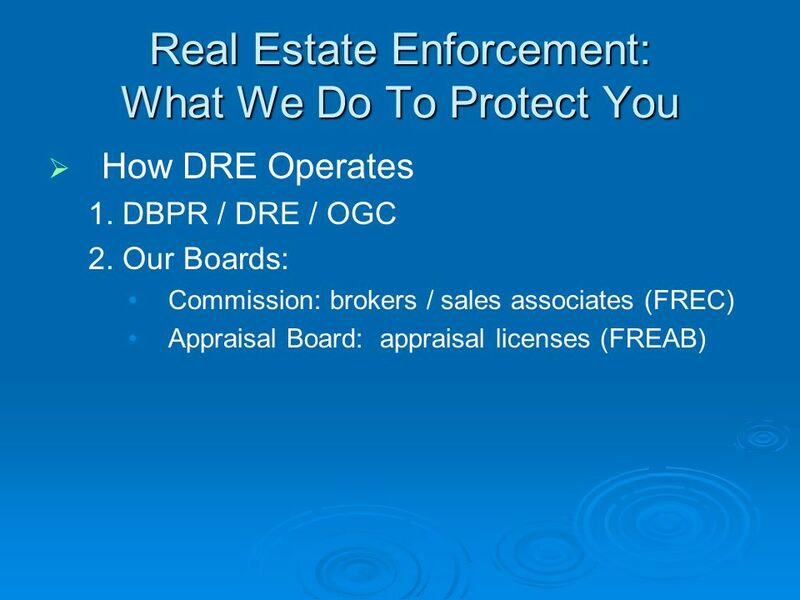 Department of Business & Professional Regulation Division of Real Estate REAL ESTATE ENFORCEMENT: WHAT WE DO TO PROTECT YOU." 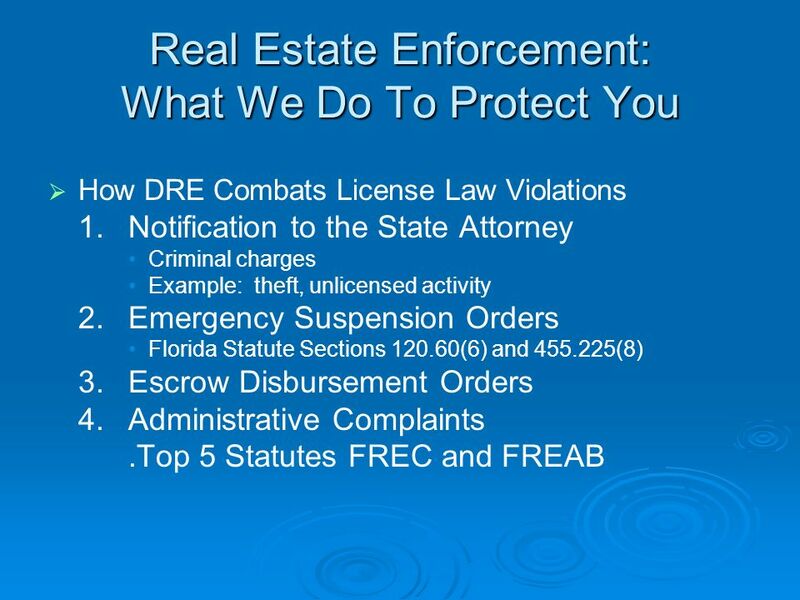 TEN WAYS TO LOSE YOUR LICENSE. 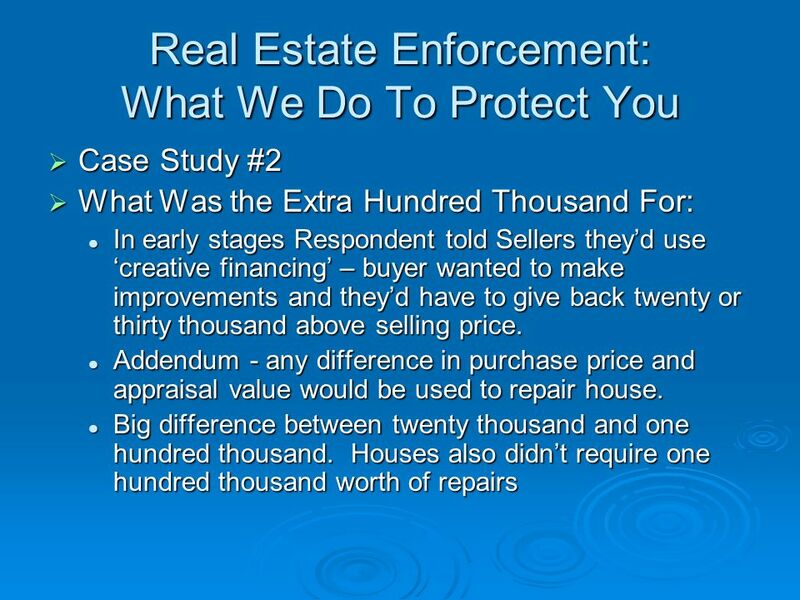 PRESENTED BY: Eileen W. Mundorff, AIRC, ACS Consumer Affairs Officer Idaho Department of Insurance. © 2009 by South-Western, Cengage Learning SAM IRLANDE R Chapter 3. 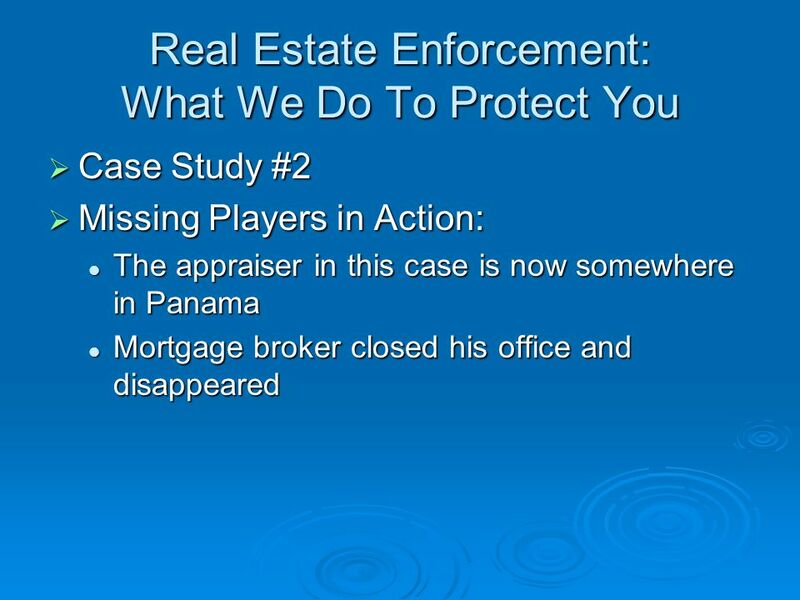 © 2011 Cengage Learning. 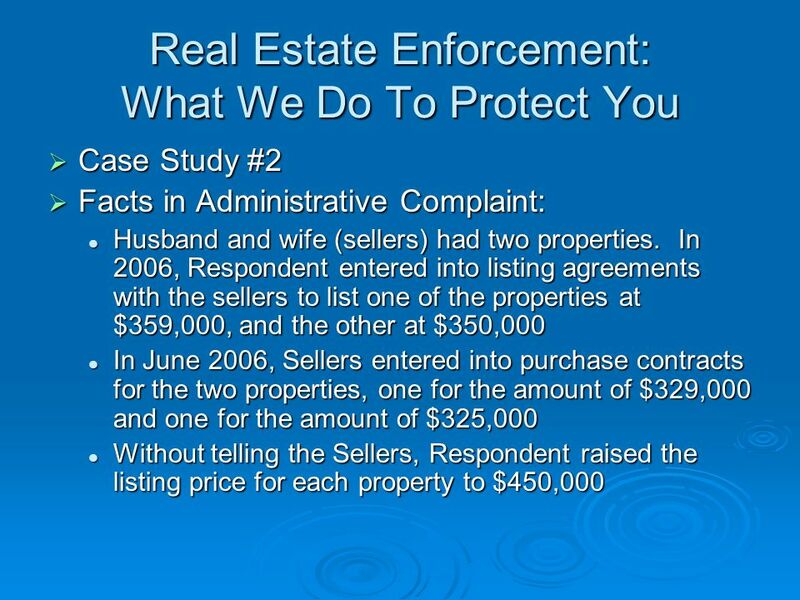 The Life of an Escrow Chapter 13 © 2011 Cengage Learning. Courtesy of: The Journey to Your Own Home Made simple… By: Multicultural Marketing Division. 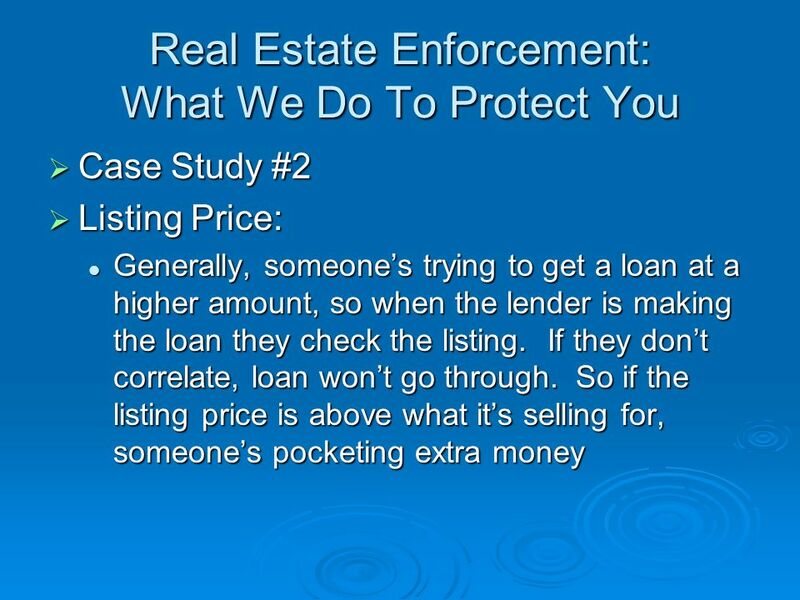 1 New obligations for real estate brokers and agents in accordance with the Proceeds of Crime (Money Laundering) and Terrorist Financing Act. 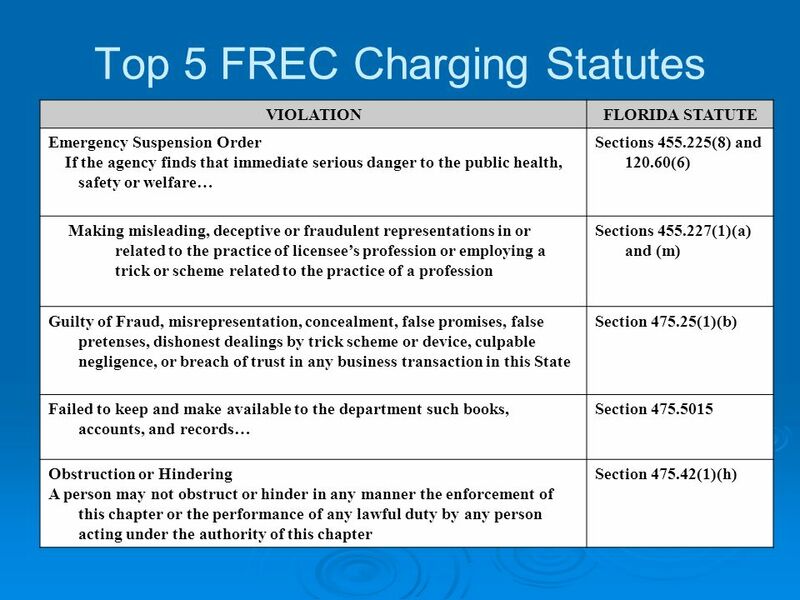 ©2011 Cengage Learning Chapter 11 Processing: DOCS, FUNDING, AND CLOSING By Dr. D. Grogan M.C. “Buzz” Chambers. 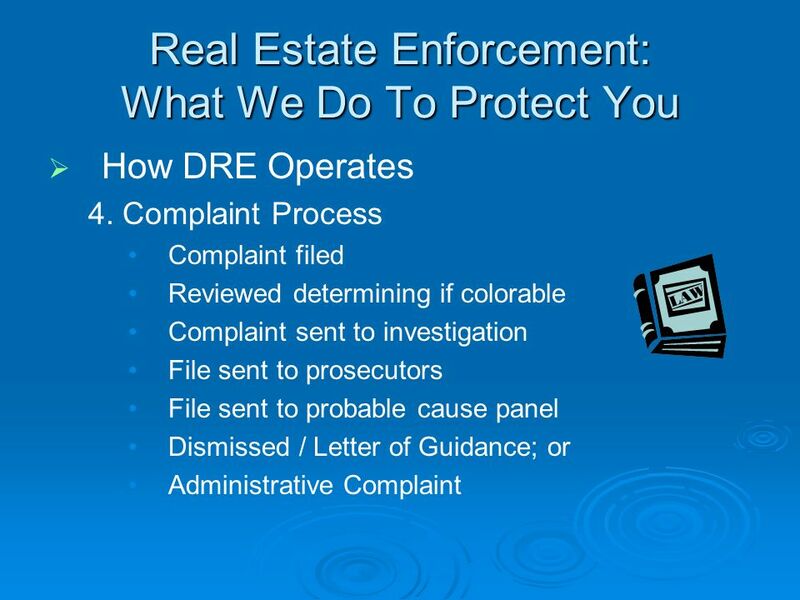 F L O R I D A D E P A R T M E N T O F B U S I N E S S A N D P R O F E S S I O N A L R E G U L A T I O N Division of Regulation Complaint Process Division. 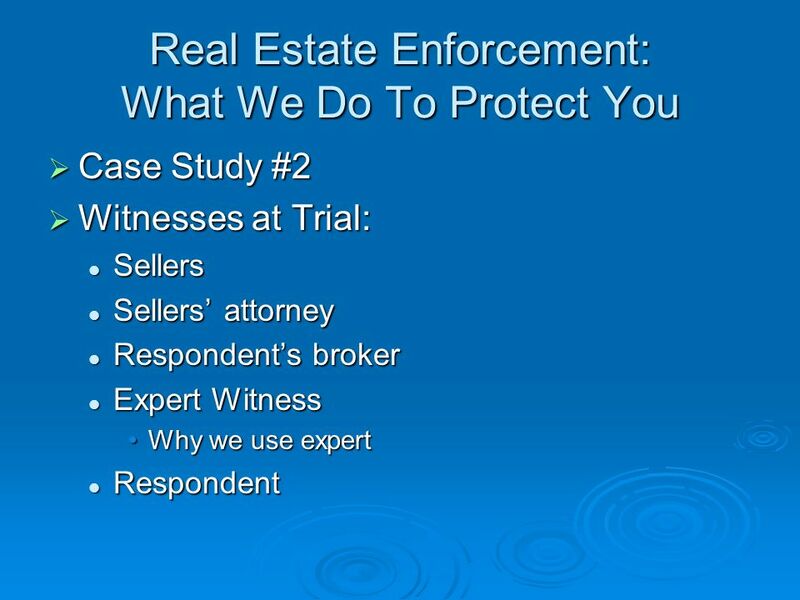 Chapter 8 Real Estate Brokerage The Real Estate Sales Process –Listing agreements (broker/owner relations) –Marketing the property and qualifying buyers. Thomson/South-Western©2008 Chapter 20 The Principal-Broker Relationship: Agency _______________________________________. 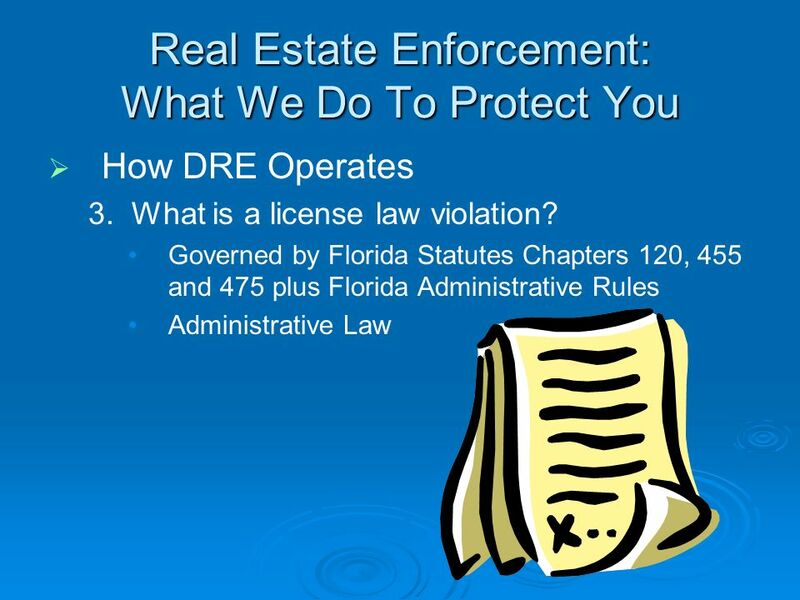 Guidelines on the Offer and Acceptance Document Presented by Sharon Officer Principal Proactive Compliance Officer. ©OnCourse Learning. All Rights Reserved.. 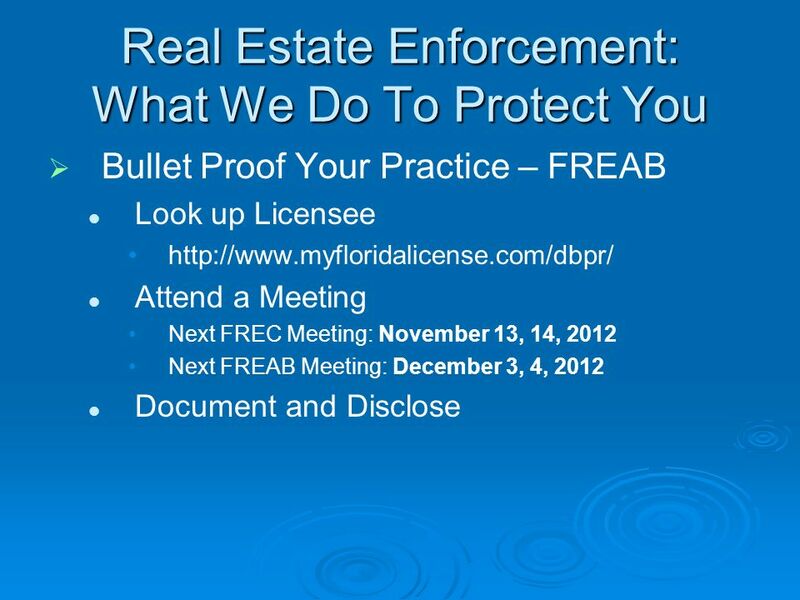 Licensing Laws and Professional Affiliation ©OnCourse Learning. All Rights Reserved. Chapter 9. 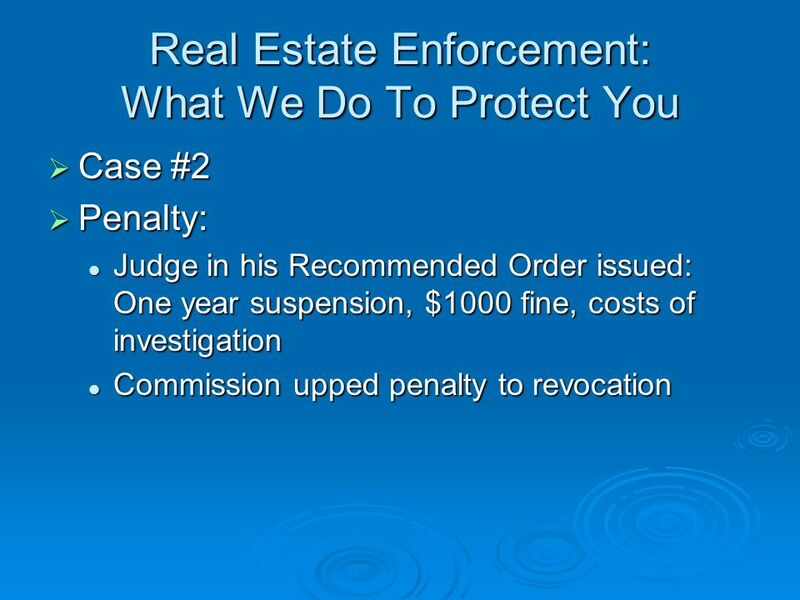 Texas Real Estate Contracts 4 th Edition © 2015 OnCourse Learning. 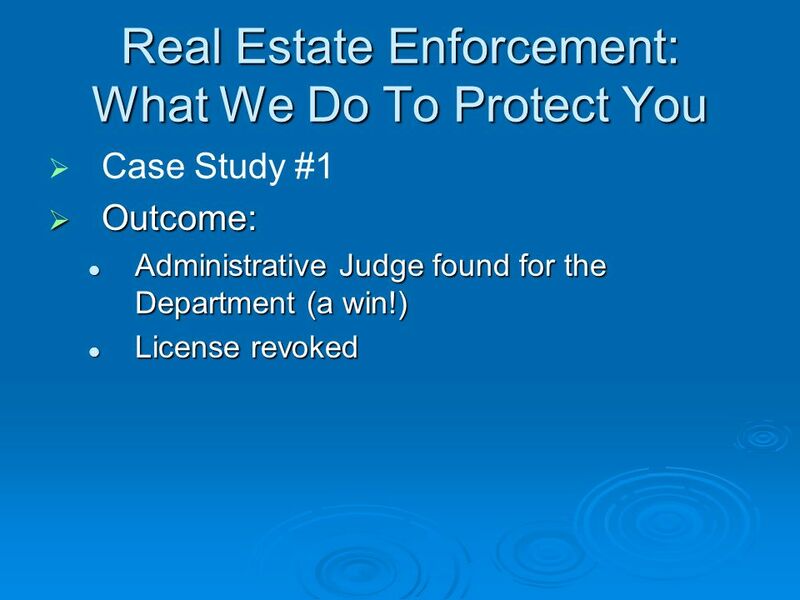 Property Management Webinar Series TRUST ACCOUNTS Instructed by Abby Lee, Associate Counsel February 18, 2015 Download the PowerPoint slides now at. 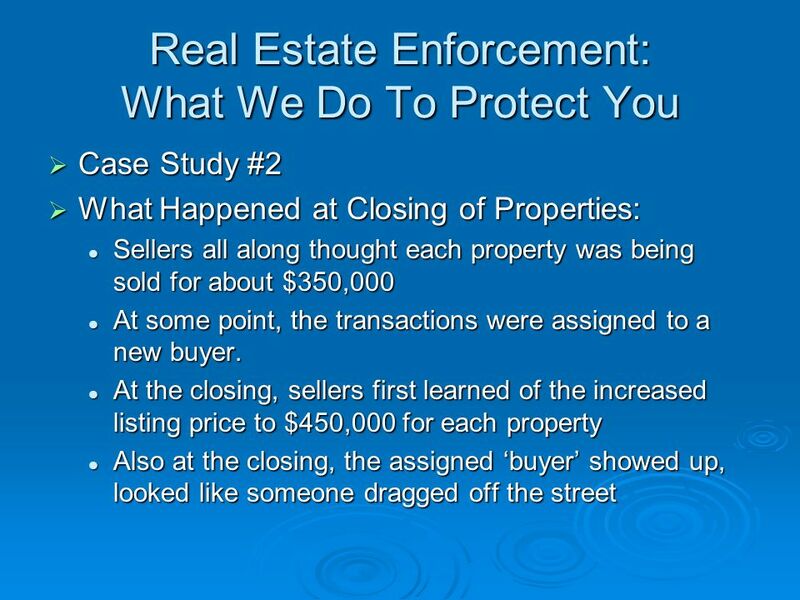 SHORT SALE Presented by: Josefina M. Serrano Mission College: RLEST091 Instructor: Mr. Frank Diaz.